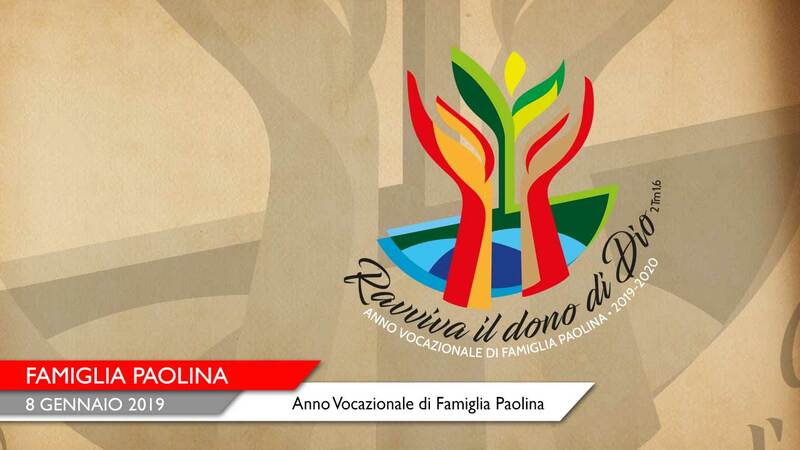 The Superior Generals of the Pauline Family, in a Letter of Indiction dated 20 August 2018, have announced the Year of Vocation of the Pauline Family that begins on 25 January 2019 and ends on 25 January 2020. We kindly refer you to the aforementioned letter where the Superiors General specified at least five reasons for this auspicious celebration of the entire Pauline Family worldwide. The theme of this vocation year «Stir up the gift of God» (2Tim 1:6) is graphically rendered with a brilliantly crafted logo, with a propitious explanation of the same. Providentially, the year 2019 is truly significant for us in the Family because we are also celebrating the centenary of the “Pact” proposed to us by the Founder since 1919 and, in particular, for us in the SSP, we will hold the 2nd International Seminar of Formation for the Mission in November of this year. As we continue to be grateful and celebrate the gift of our vocation in view of «doing everything for the Gospel», it is our fervent hope that as we live our consecration joyfully every day we become as well authentic promoters of the Pauline vocation to the young who are among us and to those who want “to come and see” our way of life and mission. The young, as the Synod of Bishops for the Youth aptly concluded, are “our present and future”. In the spirit and style of Pope Francis may we truly «welcome, protect, motivate and integrate» them (Final Document of the Synod of Bishops 2018, no. 147) into our communities and in our specific mission in the culture of communication, in particular, in social media. Young people and today’s society need “witnesses” rather than “preachers”. And may we, not others, be the Witnesses of the Pauline Vocation. From the transparency and credibility of our testimony derive its attraction to this vocation. Hence, the commitment for every Pauline to make his own vocation more visible and outgoing both as a personal response to the call and as a prophetic presence in today’s society. «Andrew met his brother Simon and said to him: “We have found the Messiah”, which means Christ, and led him to Jesus» (Jn 1:41). Our commitment, in this year of vocation, should be the same as that of the Apostle Andrew: to bear witness to having found the Messiah and lead others to Jesus. May all our Pauline saints who have preceded us accompany and guide us in our vocation journey in all its realities in living and giving Jesus Master, Way, Truth and Life to the men and women of today.